In their heydays, they were the biggest names in global football. They played, they conquered and retired graciously for the next generation to take over. But they left the game with a dream - the hope of seeing their children replicate their success on the pitch. Some have managed to live up to the name of their famous dads, while others are still coming up the ranks in the competitive world of football. The offspring of Pele, Diego Maradona, Franz Beckenbauer could never step out of their fathers' shadow and become successful players at the professional level. Yet, there are others like Paolo Maldini and Michael Laudrup, who have surpassed their famous fathers in one way or another. The Indian Super League too has its set of dads, whose children are now looking to become a household name. The ISL has attracted many famous footballers, marquee managers since its inception. In this slideshow, we take a look at three footballers who are looking to replicate the success of their famous fathers in the game. Teddy Sheringham was a prolific forward for club and country. Over the course of his glittering career, he has appeared for clubs like Tottenham Hotspur, Manchester United and Portsmouth, scoring 342 times. Sheringham won the Premier League thrice and has also clinched the FA Cup as well as the Champions League. He has appeared 51 times for the Three Lions and has struck 11 times over the course of his international career. 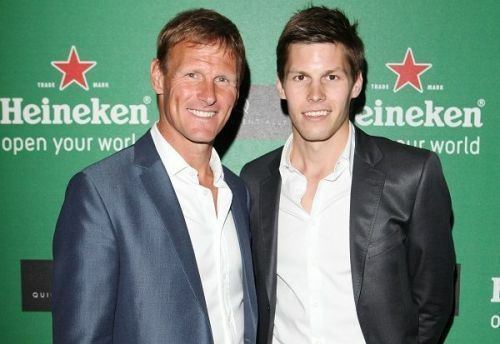 Following in the footsteps of a successful footballing father is hard enough for most, but being the son of Teddy Sheringham must be doubly difficult. Charlie Sheringham had a crack at carrying on the family legacy by starting out at Crystal Palace. Several loans spells ensued before a career in the lower leagues beckoned. Charlie had a brief stint in Bangladesh with Saif SC before moving back to England. He currently plays for Dartford of the National League South. Charlie had expressed interest in playing for ATK under his father, but the move did not happen. "If the opportunity comes then yes, maybe. It would be nice. It'll be nice, let’s see. Maybe one day in the future," Charlie told the Dhaka Tribune.